You are currently browsing the tag archive for the ‘tree removal’ tag. 12-15 street trees were removed from Campbell Street down Unwins Bridge Road. Around 12 – 15 Evergreen ash (Fraxinus griffithii) had been chopped down from the corner of Campbell street & along the eastern side of Unwins Bridge Road. 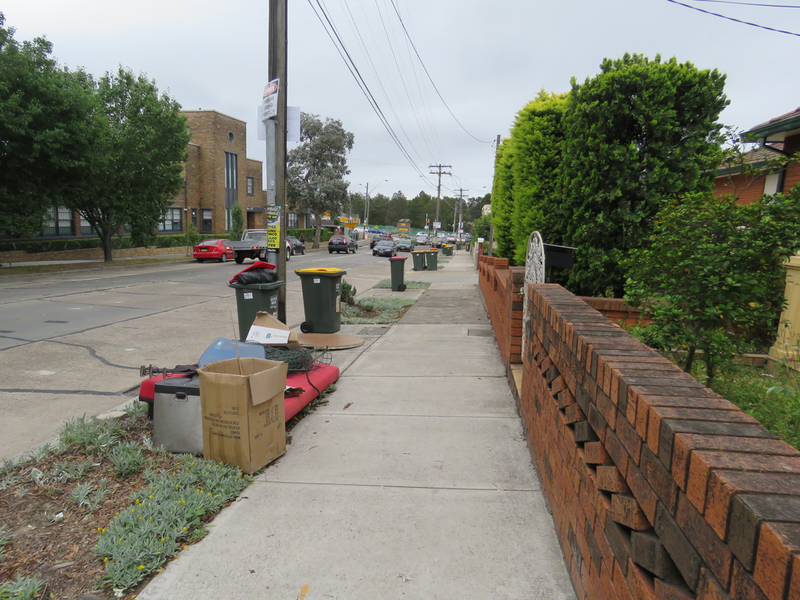 I wrote to Inner West Council to ask why & they replied also in February. Apologies for the delay. I am busy with other things over the last few months, though hopefully things should return to normal soon. 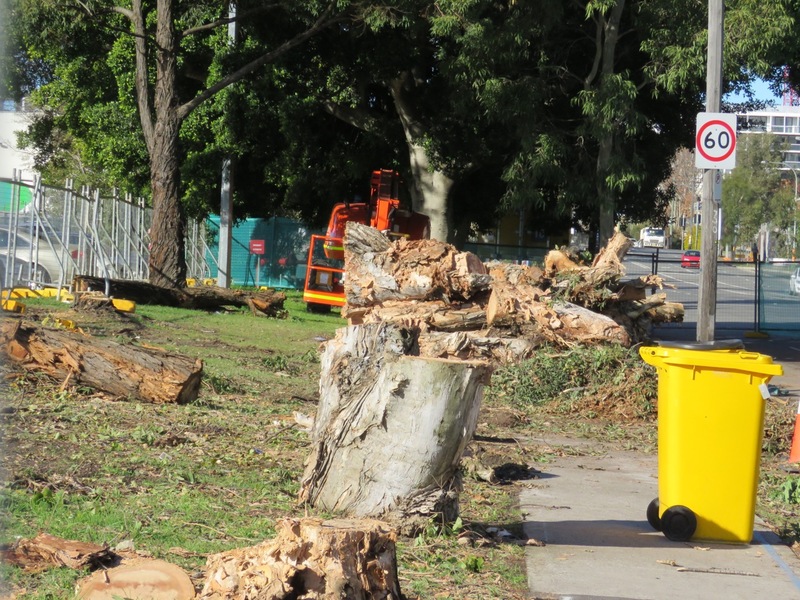 Council said the trees were removed as part of WestConnex works. Council also said that replacement trees will be planted somewhere in the area to make up for the loss in this particular location. So at least we know. The healthy Bottlebrush outside 3 Derby Street Camperdown. The worst part of the footpath outside 7 Derby Street. You can also see an NBN channel. 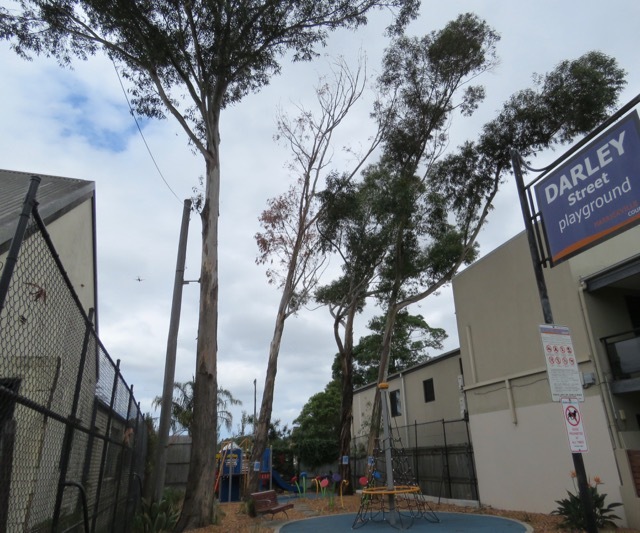 Inner West Council – Marrickville have given notice that they intend to remove 4 trees in Camperdown. 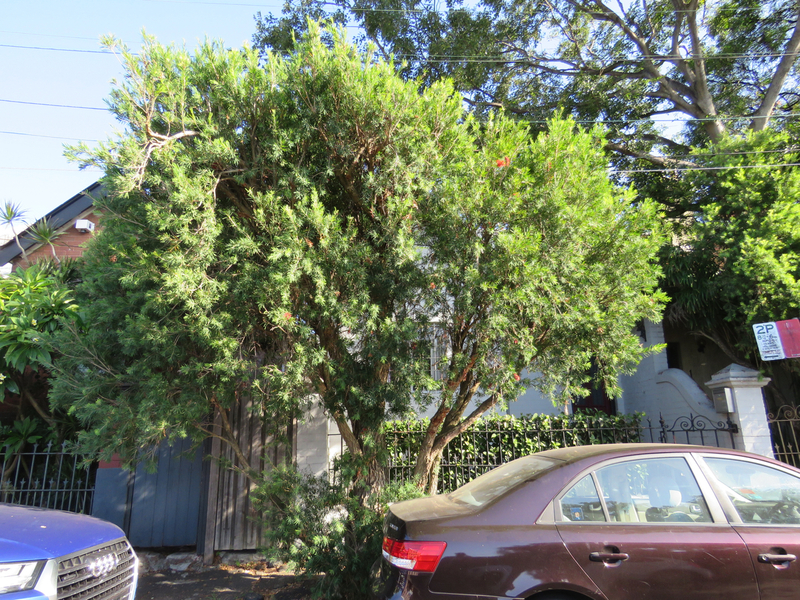 Tree number 1: A Bottlebrush (Callistemon viminalis ) outside 3 Derby Street Camperdown. 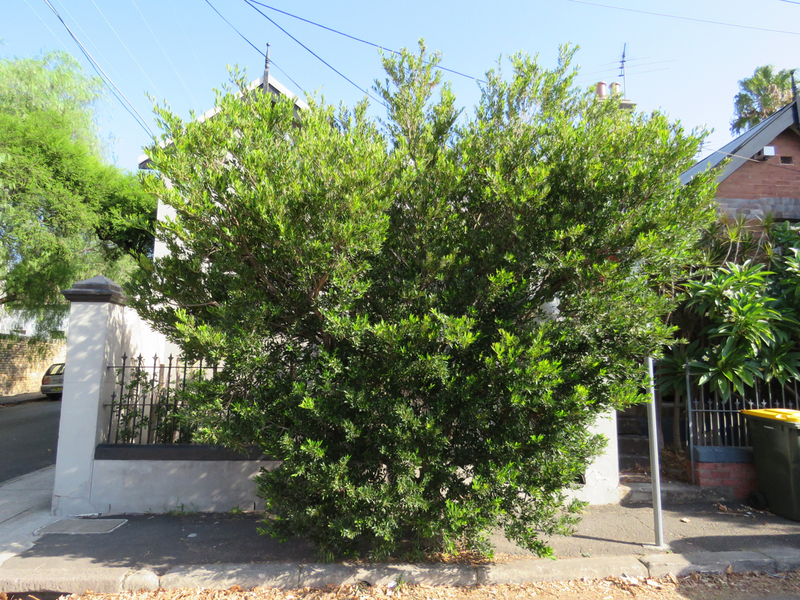 Tree number 2: A Small leaf lilly pilly (Syzygium species) outside 7 Derby Street Camperdown. The footpath is narrow & has two small, but healthy trees. I was amazed that council even notified the community of their proposed removal because they appear to be under 5-metres. I have noticed that people tend to walk with their dog down the road of this quiet back street rather than along the footpath. If a car does come down Derby Street, it is easy to get off the road. To lose both these trees to replace a footpath does not seem necessary to me. 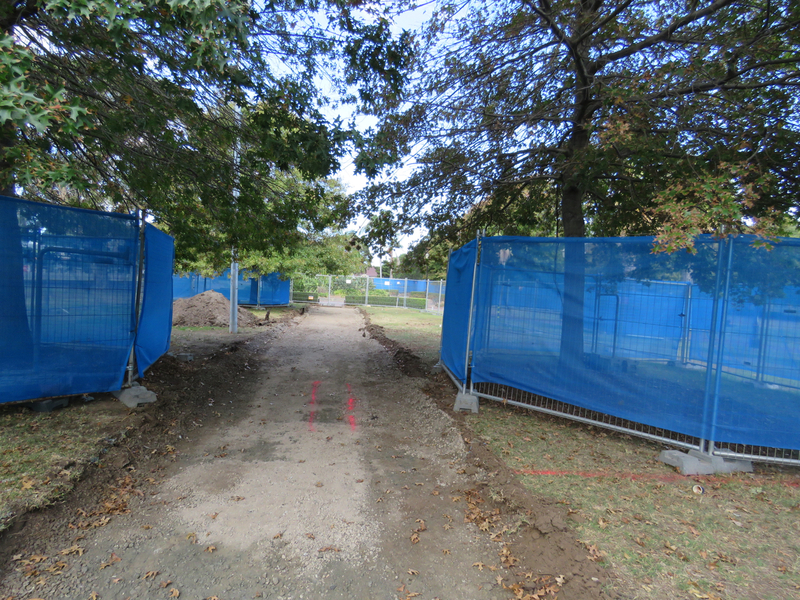 I am pretty certain that the footpath can be replaced while keeping the trees. 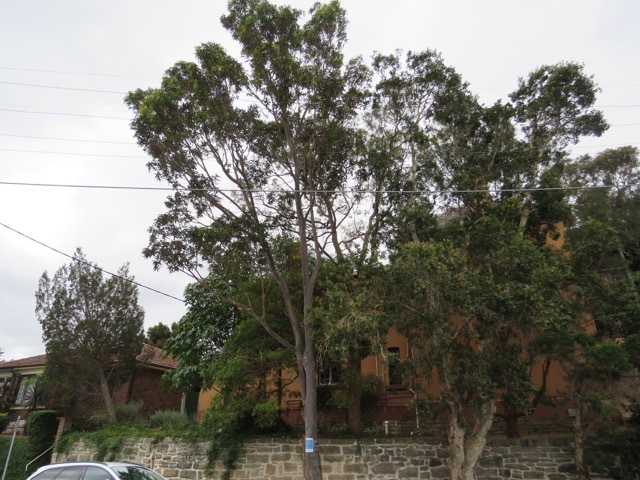 To replace only one of these trees in this location is another loss despite the proposed planting of a spotted gum on O’Dea Reserve around the corner. I am not a fan of removing trees from one location to plant in another. 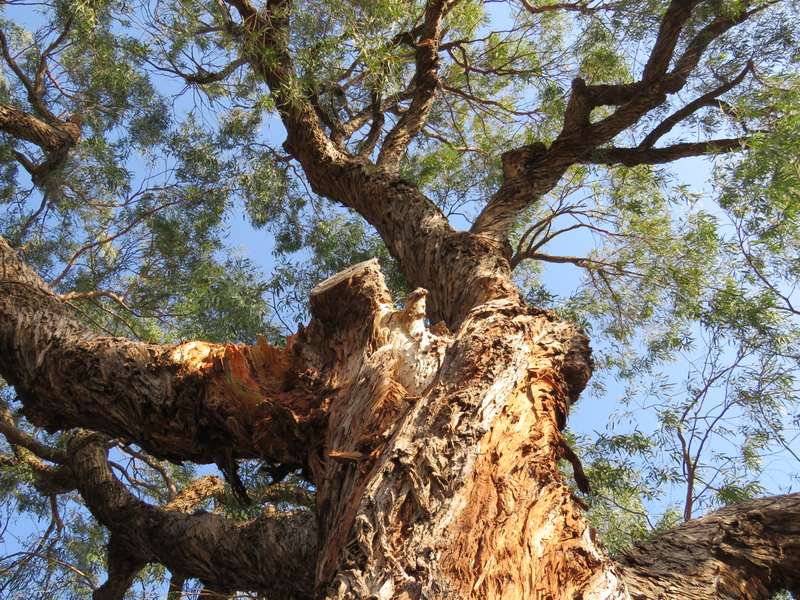 If there is room to plant a Spotted gum in O-dead Reserve, Council should do it anyway. Derby Street will be down one tree. I think Council should be looking to find more planting places for street trees, not reducing them. Then there is the issue of new tree plantings failing to survive & if the new tree does survive, the years it will take before it produces amenity & benefits. Currently, the two healthy trees provide both amenity & benefits. Neither tree had a Notification of Removal sign on them. Tree number 3: A Weeping fig (Ficus benjamina) outside 2 Ross Street Camperdown. I first saw the Weeping fig in 2011 when I posted about O’Dea Reserve. Even then I was surprised this tree was allowed to remain in this position because it was causing significant issues with the footpath. Now it has moved on to damaging the brick fence. I highly doubt this tree was planted by Council. Weeping figs are sold as lush pot plants & many people decide they would be good to put in the ground. The problem is that this tree has very strong roots & can grow into a large tree. I think it should be removed. This tree did not have a Notification of Removal sign on it. 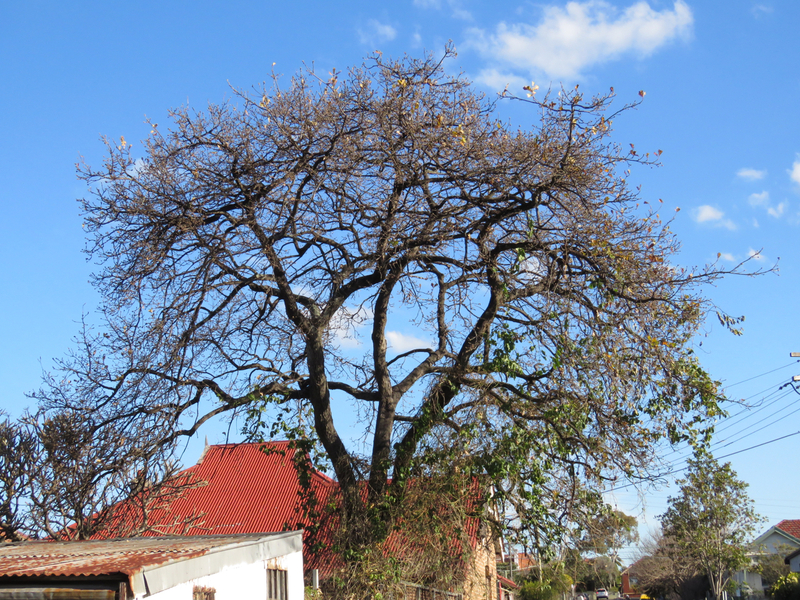 Tree number 4: A Chinese hackberry (Celtis sinensis) adjacent 2A Eton Street Camperdown. I could not find this tree. A resident tried to help me find the address to no avail. “To undertake capital footpath reconstruction and kerb extension improvement works, including replacement tree planting. 1 Black tea tree (Melaleuca bracteata) in road tree planting outside 7 Derby Street. 1 Spotted gum (Corymbia maculata) in O’Dea Reserve. That is 4 trees removed to be replaced with two, which is not good in my opinion. Council do not say when they will plant them. Black tea tree is an Australian native & is usually described as a medium sized shrub, but can reach 10-metres. It has rough dark grey bark & produces white flowers in winter/spring/summer. The flowers are attractive to birds, insects & butterflies. Spotted gum is an Australian native that grows straight & tall. It is known for its beautiful bark that shed in summer leaving behind creamy smooth bark with spots of older bark. It has dark green leaves & produces small clusters of fragrant white flowers from autumn to winter, which attract birds, bees & other insects. It is a good tree for wildlife. The bottom of the weeping fig in Ross Street Camperdown. It is not too often I will say this, but this is the wrong tree for this space. No street trees this side of the road anymore – why? I suddenly remembered that I did not post about the street tree removal at Unwins Bridge Road St Peters that I saw way back in December 2017. Better late than never. Around 12 – 15 street trees had been chopped down from the corner of Campbell street & along the eastern side of Unwins Bridge Road. The trees were Evergreen ash (Fraxinus griffithii) & most of them reached to the height limit below the powerlines. The area looks stark without them. Luckily the residents there have big healthy fig trees across the road to provide a visual of green. I spoke to two residents who said they came home from work to see the trees gone & had not received notification. One resident was angry. The other was feeling resigned. 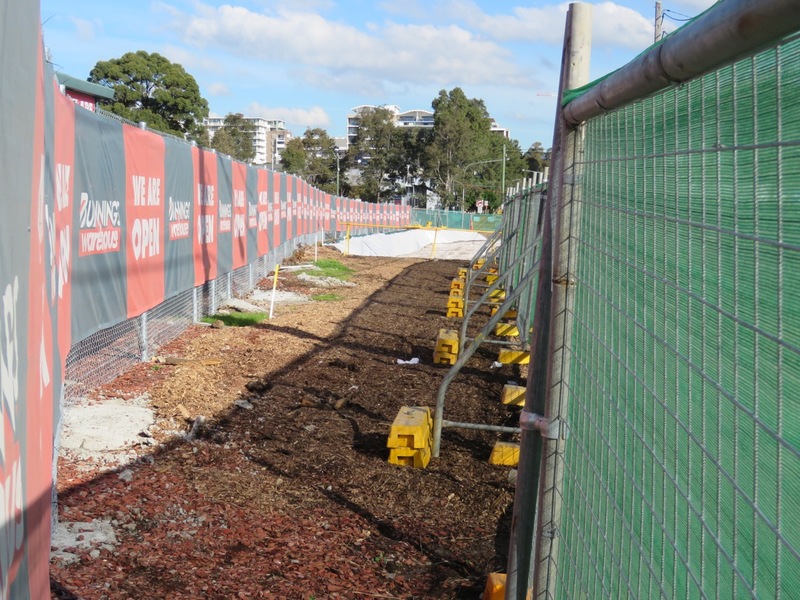 None of us could work out why the trees were removed, though we did wonder whether it was connected to WestConnex, which barrels on down Campbell Street devouring everything in its way. Street trees are vitally important in this location. They always were because this is a main road, but the increased traffic of a motorway going through a densely populated suburb makes trees & their pollution management even more important. Essential in my opinion. So I thought it would be a good idea to revisit to see what has happened since I last went. The answer is nothing. The stumps are still in the ground & the footpath & houses are unprotected from the traffic zooming past. It is hot too. Such a shame. I am hoping that in the next couple of months we will see replacement trees. Surely the residents will not be expected to live without street trees. Not there. Brittle gum to be removed. The canopy of the tree behind makes this tree look fuller and healthier than it is. 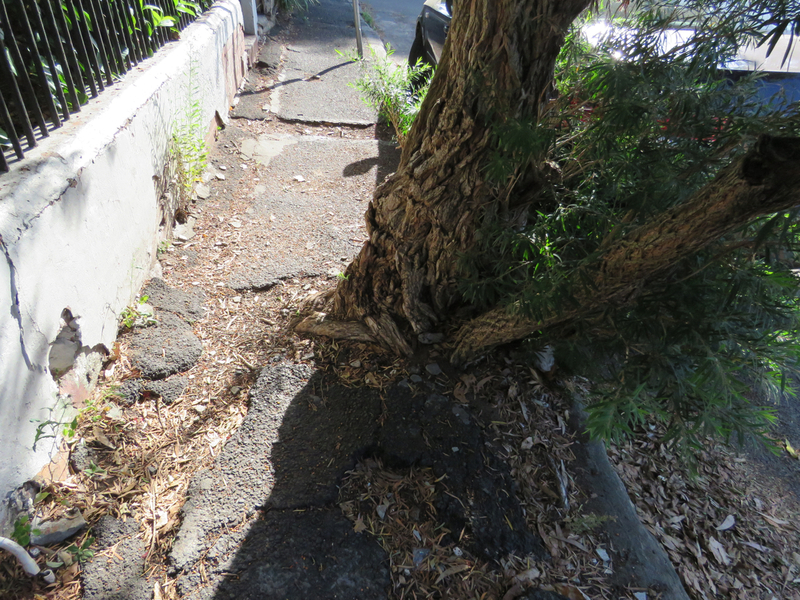 Inner West Council – Marrickville has given notice dated 10 January 2018 that they intend to remove two street trees. 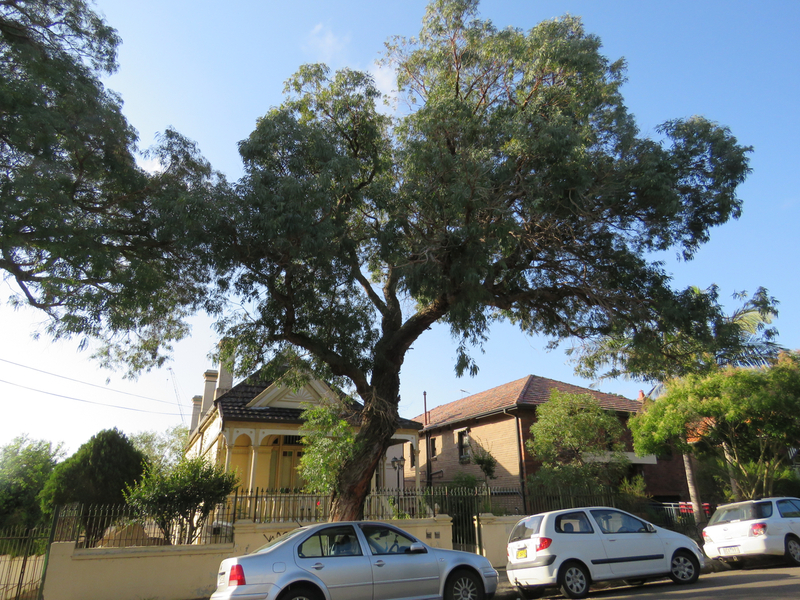 Tree number 1: A Brittle gum (Eucalyptus mannifera) outside 41 Stafford Street Stanmore. “Tree is in decline with significant decay and deadwood which cannot be mitigated by pruning. 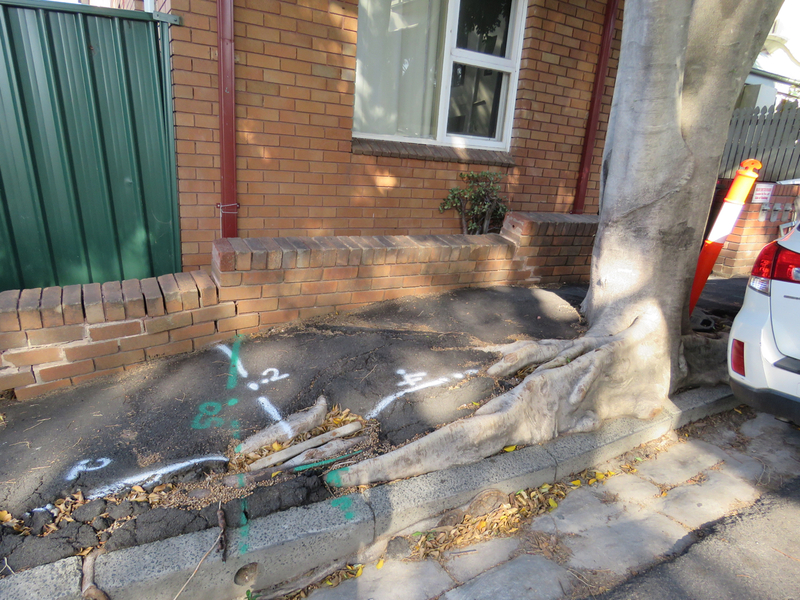 Council says they will replace with a Scribbly Gum (Eucalyptus haemastoma), but not when they will do this. 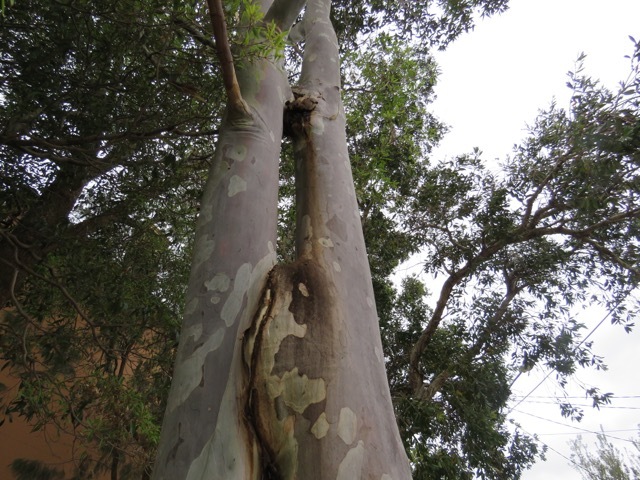 Tree number 2: A Brittle Gum (Eucalyptus mannifera) adjacent to 50 Railway Avenue Stanmore. 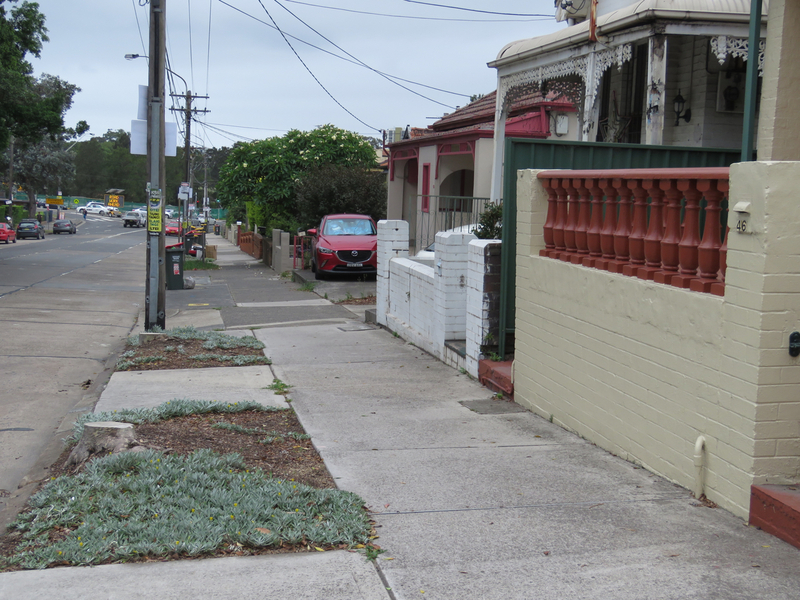 Council says they will replace this with two Scribbly Gum trees (Eucalyptus haemastoma), but not when they will do this. It’s good that two trees are being replaced for one tree removed & also good that these are big tall Australian native trees that will provide habitat & food for wildlife. Stanmore is lucky with all their big trees & these trees will continue on with this theme. A screenshot of the Brittle gums. I am fairly sure the tree closest to the edge of the caravan is the one that is to be removed. I saw no signage. The tree for removal has a blue sign on the trunk. It is unaffected by power lines. 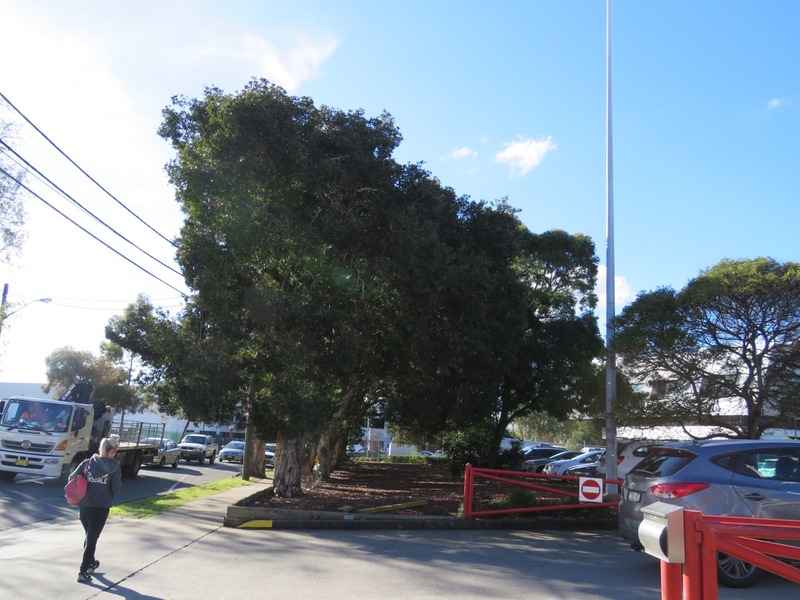 The Inner West Council has given notice of their intention to remove a Spotted gum (Corymbia maculata) outside 7 Hilltop Avenue Marrickville dated 7 October 2017. “The tree is structurally compromised & has multiple trunk defects. These defects will increase size as the tree matures & further impact the sustainability of the tree. The trunk defeats are easy to see. It is a shame that this tree needs to be removed. Council says they will replace with 2 x advanced-sized Coastal Banksias (banksia integrifolia), but not when they will do this. Replacing two for one tree is great & I thank Council for this. Small changes like this will build on our urban forest. Coastal Banksia is native to the east coast of Australia. 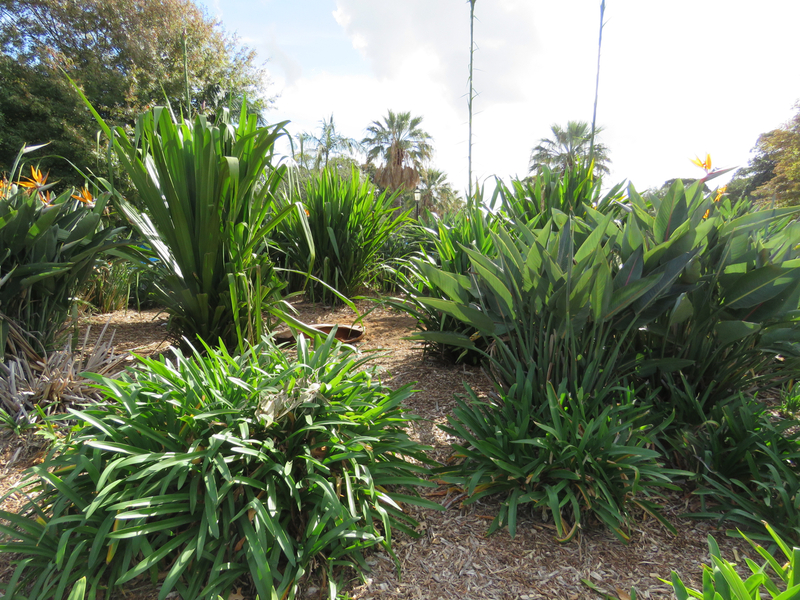 It will reach heights between 4-15 metres & produces flowers from late summer to winter. It is a food source for nectar-eating birds, seed-eating birds, insects & possums. No deadline for submissions was given, but up to now it has always been 3-weeks from notification. If you have something to say contact the Tree Manager. Darley Street Playground. The 3 trees for removal have blue signs on them and are on the right of this photo. A new Inner West Council & now a new way of putting up tree removal notifications or is this just a one off? Council’s Notice of Removal now starts with a date – presumably the date they put the notice on their website. The Notice of Removal includes no information about the deadline for submissions. It does give reasons why the tree/s are up for removal & what they will replace with, but no information as to when the replacement trees will be planted. Neither is there any invitation to contact the Tree Manager to discuss, as was the norm previously. These are significant changes & not much about consultation. 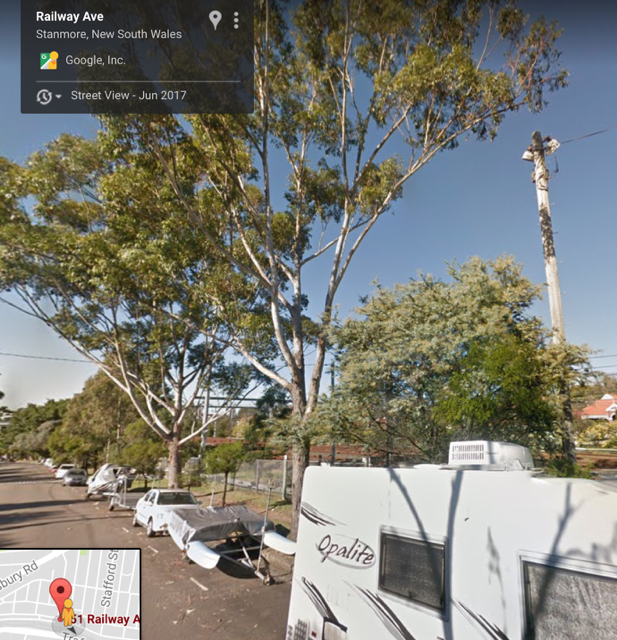 Council have given notice of their intention to remove 3 x Grey gums (Eucalyptus punctata) in the Darley Street Playground, Darley Street Newtown dated 26th September 2017. “3 trees are proposed for removal. One tree is dead & the other two have significantly declined in health, & their structural integrity has been compromised. There are 4 Grey gums in this small playground. All trees have been severely pruned when young & all have grown into what I consider a long trunk with a lollipop canopy. 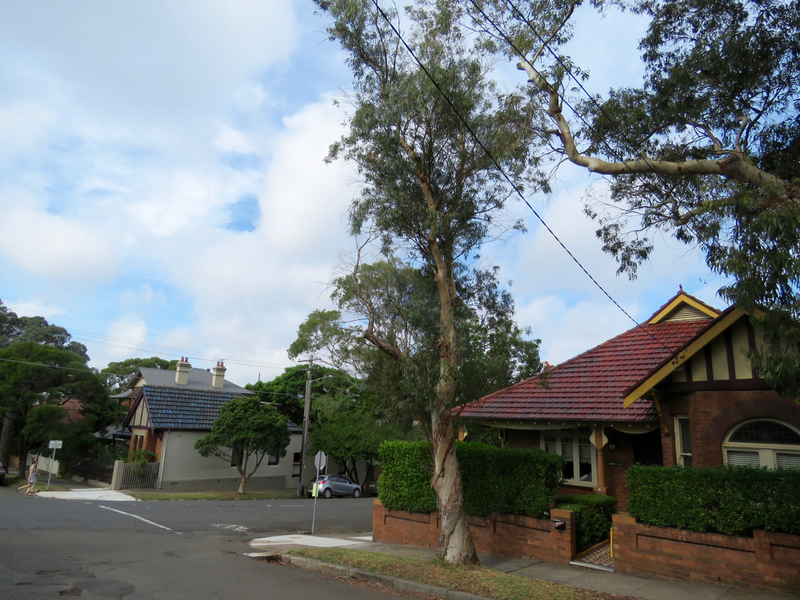 Two of the trees lean towards a neighbouring house. An advanced-sized Sydney Red Gum (angophora costata). The Illawarra flame tree is a deciduous tree native to coastal rainforests from central NSW to far north Queensland. It develops clusters of red bell shaped flowers spring-summer. They may not flower every year, but when they do they can look spectacular. The flame tree is regarded as a small to medium-sized tree, though in perfect growing conditions can reach 35-metres in height. Nectar-eating wildlife love this tree when in flower & so do most Sydney-siders. 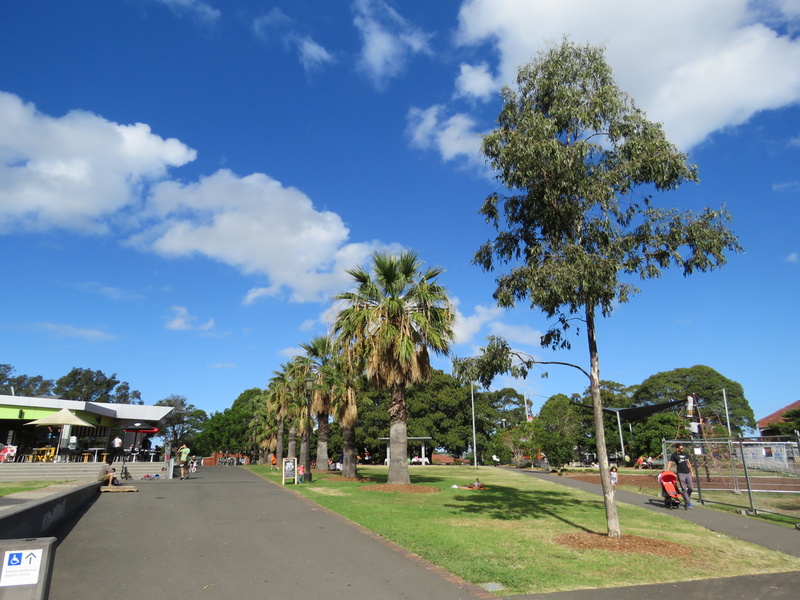 The Sydney red gum is native to the Sydney Basin & along the NSW coast. They can reach approximately 25-meters in height. The bark is a lovely salmon/pink that gradually turns grey. It produced large bunches of white flowers over the summer months, which is good food for nectar-eating wildlife. It grows well on rocky outcrops & can develop a gnarled & twisted appearance, which is much loved by many. I think these are great choices for this playground & will add much in the way of beauty to this space. Another of Council’s changes is the Notification of Removal signs on the trees. These are a great improvement on what was used previously. They are easy to read & provide good information to the community. I thank Council for this. I also thank Council for continuing to use sticky tape to attach the signs to the trees. No deadline for submissions was given, but up to now it has always been 3-weeks, so if you have something to say, contact the Tree Manager at Council. Gardeners Road Alexandria outside Bunnings. If you remember, this street was full of big street trees. The fig tree in the background may have already been chopped down. It’s not our area, but close enough to affect us. Carnage and much more to come. Last week we took a trip to Bunnings in Alexandria. I had been told that street trees had been removed in Gardeners Road, so was on the lookout. I am never prepared for what I see. Yes, I know that trees will be gone, but to actually see the barrenness & devastation is always quite a shock. I am often surprised at the quality of the trees they sacrifice for wider roads, as in this case, or for development & I always wonder whether the trees could have remained if the planners had taken another approach to their designs. As we drove up Canal Road I was concentrating on the development that is happening. Massive high-rise apartment blocks are being built all the way to the footpath. I can’t help but feel for the people who will be living above the belching exhaust fumes from trucks & other vehicles that clog this road. The NSW government is telling us loud & clear that this is the future of housing in Sydney. What you are looking at is Future Sydney arriving fast. We get to Bunnings & turned left into Bourke Road. I was glad I was not driving because I could not rip my eyes away from the corner where a giant tree stump was laid bare & what was filled with big trees was empty. This corner has always been glorious because of the two rows of big trees. These were street trees & the inner row of trees that Bunnings did not rip out for parking when they took over the site so many years ago. I have many times waited outside & watched birds while my husband shopped. 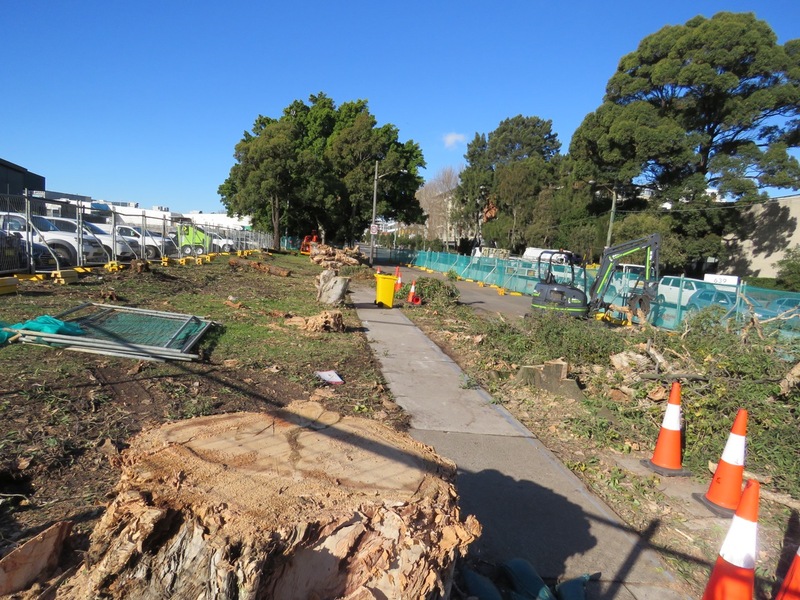 Between Gardeners Road & Bourke Road, a large amount of big fat mature trees have been chopped down. They are widening the road here – I think to cope with the traffic that will come off WestConnex less than 1km away. I spoke to staff at Bunnings who all expressed shock at the loss of the trees. One said it was awful listening to all the birds when the trees were coming down. Apparently, more trees along Gardeners Road will be removed soon, including a beautiful big old fig. 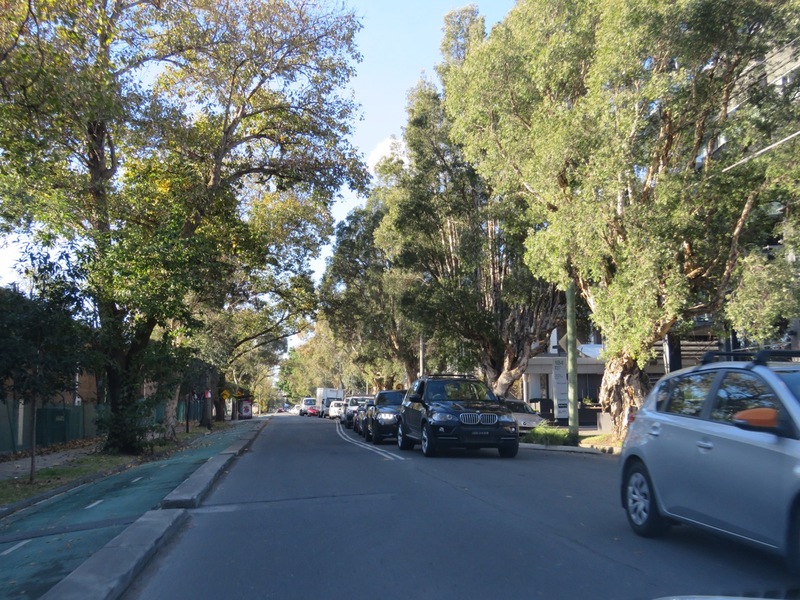 I was told that the street trees all along the eastern side of Bourke Road will also be removed. 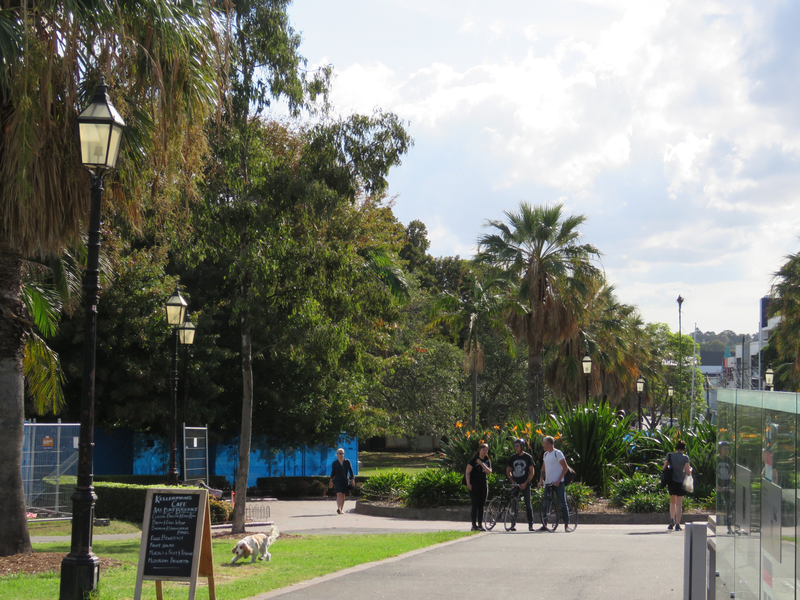 I have cycled along the bike path on Bourke Road & it is a lovely experience. Yes, it is a busy road, but I felt safe in the separated bicycle lane. I also loved that a huge part of the route was in shade from the big street trees. I think this is how all employment zones should look – green & leafy. Soon this area will look worse than our barest street. It is terribly sad to lose such undeniable beauty. It will be an incredible loss of amenity that was provided by these trees &, I imagine the impact to workers will be huge. This story is being told all around where WestConnex enters the inner suburbs. I think the toll is horrendous. This is from the entrance to Bunnings to the corner of Gardeners Road. This area was full of big trees. This is on the other side of the entrance to Bunnings. I am told these trees will be removed as well. Bourke Road Alexandria. I was told all the trees on the right side of this image for the length of the street are to be removed. I hope this information is incorrect.